After being teased for weeks by this rookie group, including solo intro videos for each member and individual Twitter accounts, I finally got to see them in action. 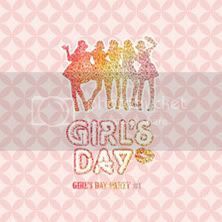 Girl's Day is a five member group under the management of DreamTea Entertainment - who have, I believe successfully, used social media to promote themselves before their official debut. Their official debut is July 9th, but they finally released the MV for their first single "Tilt My Head." - Mechanical Engineering Major at Yeungnam University. -Major in Dance from Sungkyunkwan University. That song's doing nothing for me. Sounds kinda like Perfume, but not as good. Hopefully a few more songs, or even seeing live performances of this one can do something. miss A brought it, and it doesn't feel like Girls' Day did. After the intro thought it was gonna be an awesome Korean Perfume. But was left with more like the feeling you get when you go to a discount market or a swap-meet and see those bootleg toys or t-shirts of famous cartoons or sentai characters... Sometimes it's hilarious, but sometimes it's just sad... They seem more indie than most groups so I'll give them that. Yeah, they are quick with the follow on Twitter. That's cool in a way. We are being followed by a kpop group. I thought the song was pretty good. Can't wait to see more. Just got word that the girls will be releasing a special summer album - not sure on the specifics for that. But they did release the title MV for it called "How Do I Look" - hot girls and a water park...nice combo. They should have used this song as the debut song. But what are ya gonna do? The mv was pretty cool. i think its safe to say that they are improving. they're still lacking in originality, but i kind of like their new song. its nice to hear their real voices. At least they are getting their name out there. Hope they get more exposure besides that Bouquet show. I really liked the summer song - can't wait for the special summer album to be released! Double posting only to relay the information that Jisun and Ji-in have left the group and two new members have been announced - not much more information beyond that. Haeri has the right look for a 16 year old, so I'm pleased. funny then their new album is called "Nothing Last Forever"
their new single is SO good compared to the first one. sad that 2 of the original members had to leave, but the new ones are pretty good too. Page created in 0.38 seconds with 21 queries.